Breakfast is the most important meal of the day, especially when you’re at the places that serve the best breakfast in Bahrain. Depending on your mood, you will find that Bahrain has a lot to offer. Whether you’re looking for an authentic breakfast or seeking international cuisine. If you treat yourself to a delicious meal, your day will get off to the right start. So free up your mornings and try the 7 best breakfast venues for the ultimate breakfast in Bahrain. If you’re in the mood for authentic food, then Haji Gahwa is where you want to be. Not only is it one of Bahrain’s best breakfast destinations, it is also a reflection of the nation’s rich culture. 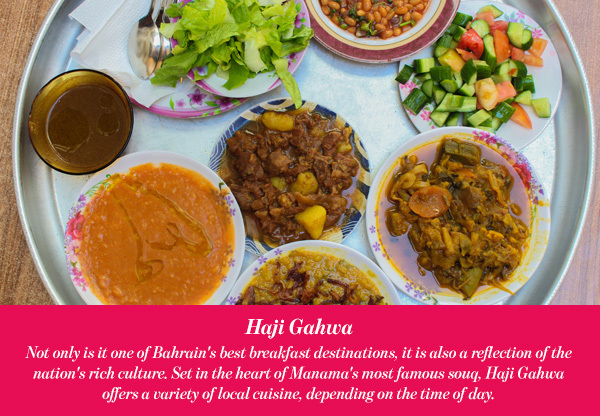 Set in the heart of Manama’s most famous souq, Haji Gahwa offers a variety of local cuisine, depending on the time of day. Their home-cooked delicious meals come in generous portions at reasonable prices. The atmosphere is warm and inviting and the staff is always ready to serve you with a smile. There’s no better way to have a Bahraini breakfast. 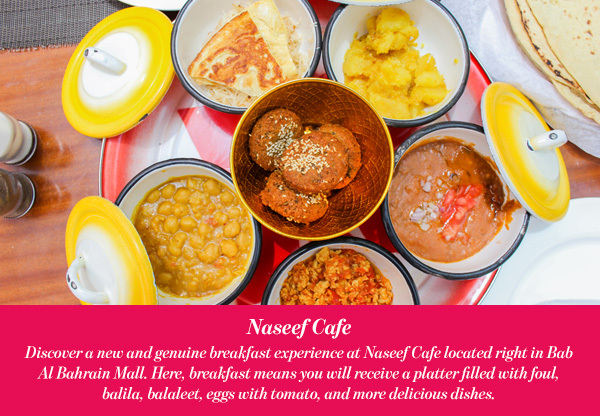 Discover a new and genuine breakfast experience at Naseef Cafe located right in Bab Al Bahrain Mall. Here, breakfast means you will receive a platter filled with foul, balila, balaleet, eggs with tomato, and more delicious dishes. Complementing the platter is a colorful dellah of karak chai that will go perfectly with the satisfying meal. After breakfast, make sure you try their one-of-a-kind ice cream that will keep you coming back for more. In addition to having an impressive breakfast in Bahrain, you will find that the cultural richness of Bab Al Bahrain is the best atmosphere for the first meal of the day. 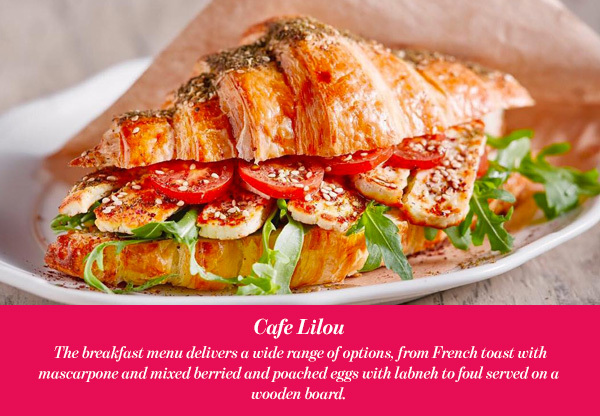 Cafe Lilou is the perfect place for delicious food and excellent service. With an elegant Parisian theme, this cafe serves breakfast, lunch, and dinner. The breakfast menu delivers a wide range of options, from French toast with mascarpone and mixed berried and poached eggs with labneh to foul served on a wooden board. Every single dish is carefully presented because of course, a delicious meal has to please the eyes. Coffee, tea, juices, and smoothies are also available to improve the whole experience. You can visit Cafe Lilou in Adliya, Seef, or Riffa. This elegant restaurant is known to serve some of the best meals in Bahrain. If the fascinating decor doesn’t impress you, the food most certainly will. My Cafe boasts a breakfast menu that ranges from delicious eggs and pastries to a full Arabian breakfast. Eggs fried in garlic, foul, mahwaya and a side of labneh and olives is all you need to start off your day. 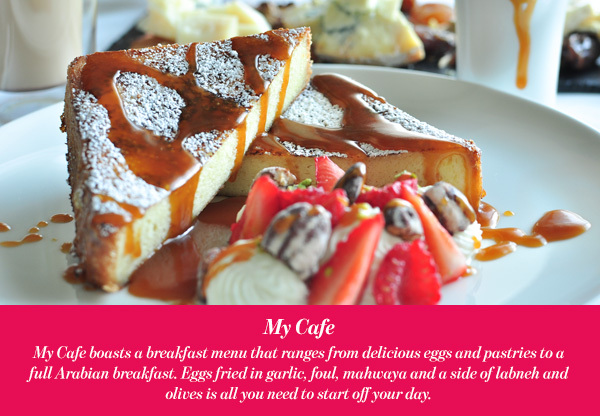 Not to mention their aromatic coffee that is the perfect companion for their hearty meal. Moreover, the staff members are known for their attentive nature and ability to notice every small detail. 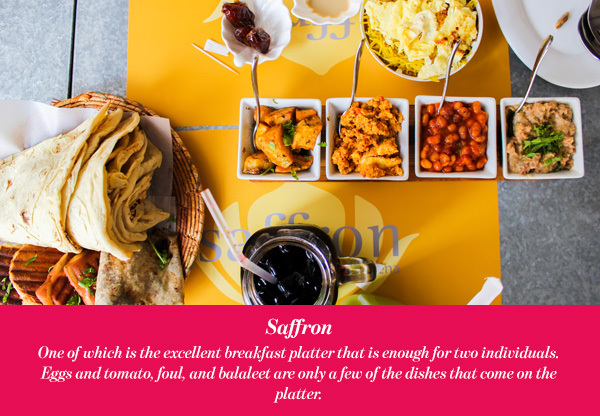 Saffron is one of the best breakfast destinations for quite a few reasons. One of which is the excellent breakfast platter that is enough for two individuals. Eggs and tomato, foul, and balaleet are only a few of the dishes that come on the platter. You will find that every dish is filled with flavor and made to perfection. Saffron has three branches; one in Bab Al Bahrain Mall, one in Riffa Fort, and the most authentic of them all, the Souq Al Qaysariya branch. It is made out of a renovated traditional Bahraini house. The floor is made of glass and underneath it lays a preserved traditional date press. With a charming British influence, The Orangery Tearoom and Patisserie will treat you to an exciting breakfast in Bahrain. This venue is able to present traditional breakfast dishes with a unique and original twist. 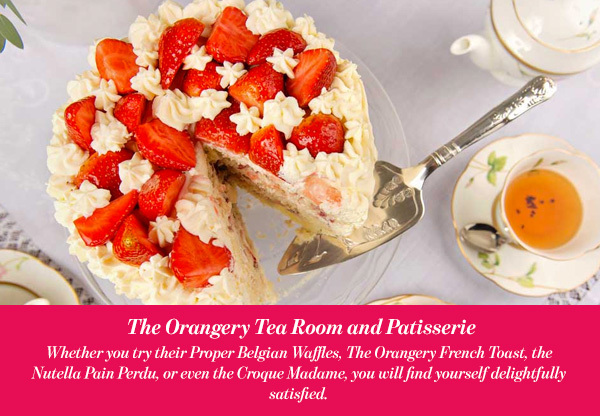 Whether you try their Proper Belgian Waffles, The Orangery French Toast, the Nutella Pain Perdu, or even the Croque Madame, you will find yourself delightfully satisfied. The Orangery also offers a selection of freshly baked cakes. Furthermore, the exceptional staff will always tend to your needs and guarantee you a pleasant breakfast. Although the name would suggest that this restaurant serves chocolate inspired dishes, it is far from that. 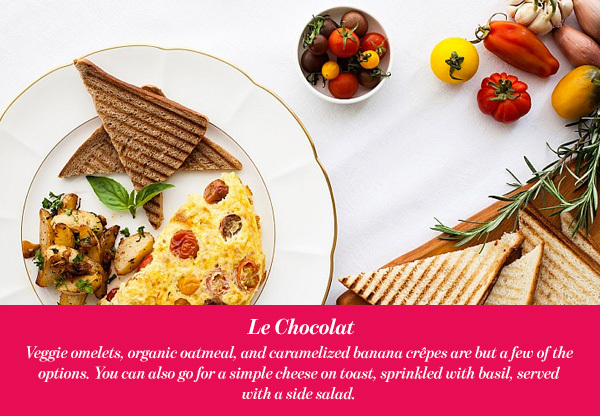 In addition to wood-fired pizzas and cakes, Le Chocolat also serves wonderful breakfast options. With traditional Middle Eastern, English, and Continental platters, it will be hard to pick a favorite. However, that’s not all they serve at Le Chocolat. Veggie omelets, organic oatmeal, and caramelized banana crêpes are but a few of the options. You can also go for a simple cheese on toast, sprinkled with basil, served with a side salad. Whichever you decide on, you will find this is definitely one of the best breakfast places in Bahrain.